Paul Tankersley, BSN, RN, OCN, CCTN, ACLS, PALS, NRP has been a nurse for 8+ year, employed as a infection prevention and control nurse in Houston medical center in an LTAC setting. Involved with the cardiothoracic transplant program in Houston’s medical center, an ICP/Clinical Quality Consultant and educator for LTAC and psychiatric hospitals, creation of the physician liaison program to ensure patient, nurse and physician communication focuses on care without time delays or errors. Paul is currently enrolled in a MSN-NP program at Galen College in Houston, Texas and anticipates to graduate in 2019. 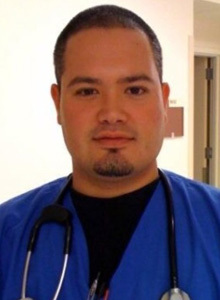 He completed the LVN to RN bridge program with CHCP (College for Healthcare Professionals) a partner with NAA. Other clinical experience includes: medical/surgical intensive care, Cardiothoracic, renal and hepatic transplant, LVAD & surgical procedures nurse as well as CMS clinical billing and coding. The past year of my life has been crazy. This past year has proven to be a real challenge. As a full time nurse and nursing student, I have an over-whelming number of assignments, duties, and tasks to keep up with on a daily basis. Add in 12 hour clinicals 3 days a week, there is very little downtime in my life. In addition to work and school, I am in the middle of trying to build a new home. Just a ton on my plate until school is finished next year, but I wouldn’t trade my life for anything less. I have goals to complete this LVN to RN bridge program so I can work toward my next career goal. Infection prevention and control has changed my life, and I love being a nurse. It is the most rewarding career. There are so many opportunities for nurses whether it is at the bedside, in the clinic, on the unit, in the classroom, or leading. Going to school at College for Healthcare Professionals has been a real blessing in my life. Because I am a member of Nurse Advocacy Association, I receive a discount on my tuition each semester which makes going to school not only rewarding, but affordable. I have had the opportunity to meet many new friends and peers at CHCP. We work as a team to complete our education which is one of the exciting things about going to school at CHCP. I am excited to finish the bridge program next year and to get started in my next adventure, working on my nurse practitioner degree. As a member of Nurse Advocacy Association you may be eligible to receive a 10-40% reduction in tuition for online courses.